Zero Waste – a trend born in California – has made its long way to the Czech Capital within the past years. Stores like Bez Obalu, Country Life and Sypka are places that a Zero Waster living in Prague can turn to. In 2015, the company ‘DOGG’ made its debut and made it its goal to make a zero wasting doggie owner’s life in the city easier. The philosophy of creating zero waste started way back in the 1970’s already. The reason why it has come up in the past few years in a lot of countries is the growing awareness of problems we face with our environment – such as the production of CO2 gases and dumping our waste in nature, on islands and into the sea. More and more people are keen to help the environment by reducing their usage of plastic, paper and packaging. Though Zero Waste is getting more and more popular among people in the republic, there are certain things that are hard to get without the packaging in the city. 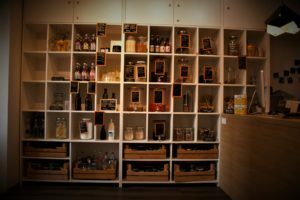 In our article ‘How to live Zero Waste in Prague‘ we showcased a few stores and behaviors that help reducing waste without having to refrain from enjoying food and other products in your daily life. In 2015, a clever team of dog lovers with fresh ideas started their company ‘DOGG’, which makes living in the capital as a Zero Waster easy; even if you have a furry friend to take care of. We visited the lovingly put together shop in Prague 7. 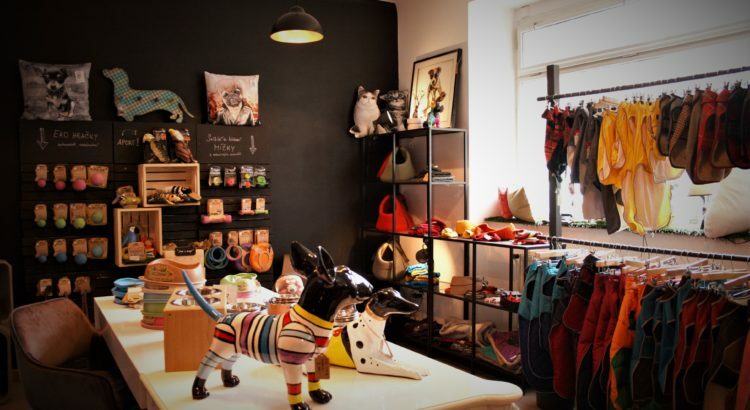 The first zero waste retail store for dogs in Prague is a wonderland for any furry friend or their owners. 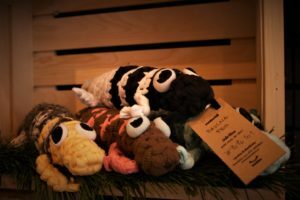 Package free treats, ecologically responsible, durable toys and most importantly: Lovingly made products from reliable sources and distributors, local designers and artists. The team behind DOGG not only takes the welfare of dogs seriously, but also strives to protect Mother Nature. Because they are dedicated to their mission, they have undertaken several steps to make sure their clients get first class, zero waste products for their quadruplets that will reduce the stress on the environment. Products they choose are made from renewable, natural and recycled materials only. If they use card boxes for online orders, they are made of recycled paper. Fillings consist of recycled and biodegradable materials. Furthermore, all packaging that holds the items from suppliers are reused and not thrown away. And to top it all off, they use the delivery service DPD, which is dedicated to reduce carbon dioxide and other greenhouse gas emissions. The idea for the hip zero waste doggy store started with – what else – a furry, four legged friend belonging to two of the founders. It was a Spring day in 2014, when the two of them wanted to get their dog some new gear for the year. Upon shopping around in the city, however, they noticed that Prague’s assortment of doggie gear was anything but magical. The selection was limited, the products all the same, in dubious quality and anything but original or tasteful. Apart from that, they were lost when trying to find quality dog food. Just as we want our family members to be healthy and eat nutritious food, we want our furry friend to have the same option, too. It was that very day when an idea popped up in their heads. The idea of being a flag ship store for quality dog food, gadgets and gear in Czech Republic, making both quadruplets and their owners happy as never. With this dream in mind and a zero wasting, artistic co-founder on their side, a long journey began. Months of planning, researching and preparing, lead to the fateful day in April 2015, when they introduced their fashionable dog collection in English style along with other must-haves for dog owners. 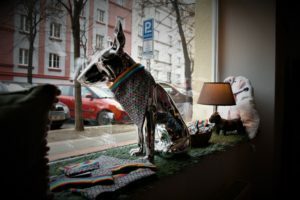 Furthermore – being the first E-shop in Czech Republic to do so – DOGG brought freshly prepared food to doggies in the city. Their hard work paid off and DOGG could enlarge their assortment, so a true dog lover could find everything for his furry friend’s needs. Of course, the environmental aspect always in mind. DOGG started to sell cosmetic products, safe eco toys and food made from fresh meat, fruit, vegetables and herbs rather than chemistry. 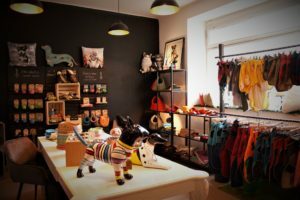 With a great concept came success and in 2018, the e-shop became a boutique store just off Tusarova tram stop in Prague 7. A stroll down Tusarova park – which is optimal for bringing your furry friend, by the way – is all it takes and doggies as well as owners can dive into wonderland. 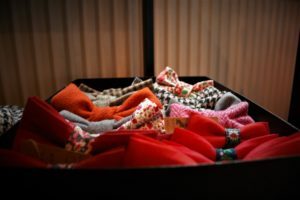 If you thought Zero Waste is anything but exciting and creative, you definitely need to visit DOGG‘s store in Holešovice. Ranging from package free treats (do not forget to bring your glass jar or container) like Serrano Ham bites and Salmon Blobs, over to extra durable toys (due to double stitching and a filling from recycled plastic bottles): DOGG has everything that makes a furry friend’s heart beat faster – and more. 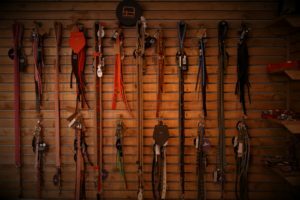 Next to treats and toys, they also offer a wide variety of colorful and trendy leashes, collars and coats. Of course, you can get medicinal items such as ear drops and anti tick spray in the store, too. The hands free leash is their absolute bestseller, along with the Beco toys for the four-legged friend. What they are all about? We checked it out. Whether you are going jogging, biking or just for a walk; the hands free leash comes in handy in all kinds of situations. By simply securing the handle on your belt or waistband, you get two free hands, one happy doggo and a secure feeling at all times. Besides the hands-free leash Lishinu, DOGG also offers a wide assortment of harnesses that are comfortable, secure and original in their design. Combine the two products and you get the perfect walk out of it. Beco is a company that lives to enhance the life of your pet and protecting the environment while doing so. By seeking to design their products in the most sustainable and ethical way, their aim is to have a lesser impact on Mother Nature. Not just ethics and sustainability are on the menu: Fun and innovation are incorporated in their toy making process, too. With their extra durable (and extra adorable) toys, they aim to make both you and your furry friend happy – and the world a little better. You can find a wide assortment of Beco’s products at DOGG. 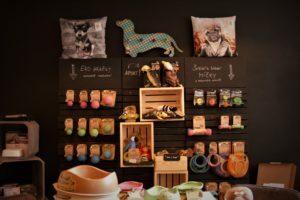 Besides Beco toys and trendy – as well as practical – accessories, DOGG also sells handmade bow ties, pillows and pictures in their store. “Basically, whatever you see in here is for sale”, says Patrik, co-founder of DOGG. 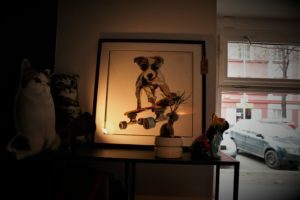 One of the founders of DOGG makes beautiful pictures of whatever material she can find – and creates cool pieces out of it that will definitely spice up any wall in the city. DOGG is not just a Zero Waste store; they also aim to source their products regionally and work with designers and butchers in the area in order to keep delivery routes short (and with that helping the environment, too). That makes every piece you buy an unique and lovingly made piece. With its fresh and creative approach, DOGG proofs that innovative ideas and environment can co-exist – even in a big city like Prague. Do you have a furry friend that deserves some yummy and environmentally friendly treats? Are you sick of throwing away the packaging of your dogs’ food? Then DOGG should be the extra stop when doing your groceries next! Have you visited the store? Does your furry friend indulge on treats, toys and more from DOGG? Tell us all about your experience at this lovely, cozy and environmentally friendly store in Prague 7!